If you are going to London, you might be tempted to visit Madam Tussaud's Rock Circus located in Oxford Circus. I was, and spent some amusing hours looking at wax figures of famous rock stars and lots of authentic rock memorabilia. But no sign of our beloved Procol Harum. I must admit I really wondered what kind of person decided as to whom was found worthy of display here. The Spice Girls were of course present, they even had a display of Twiggy. Growing up in the 60s I cannot remember that her contribution to the rock scene was invaluable. They also had a beautiful room paying tribute to the rock stars no longer amongst us, with replicas of their memorial stones. I was looking for BJ Wilson, but could not find any trace of his beautiful memorial with the words 'To know you was to love you" inscribed. Upon leaving the Rock Circus I found coupons for giving my honest opinion about the exhibition. And I did. If they read those papers, and can understand my handwriting, they will get some good arguing why Procol Harum should be presented. 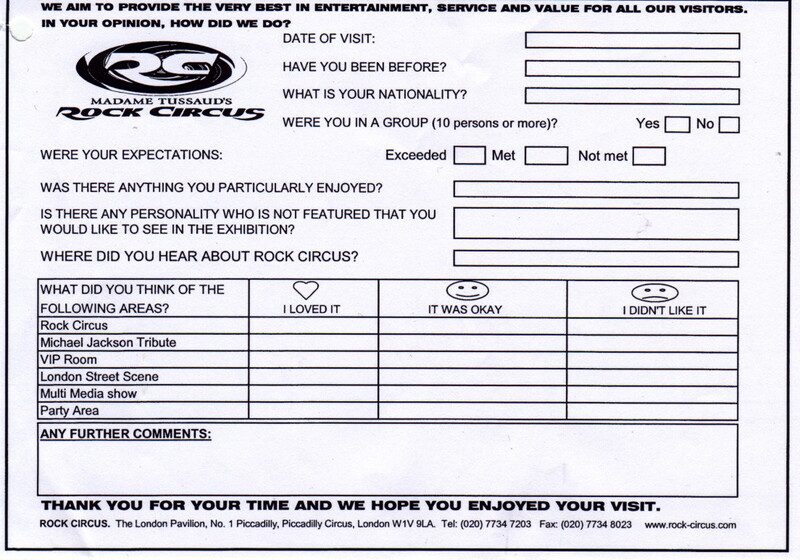 If you press on this link, you'll get a scanned image of the Rock Circus "how did we do" form. You may print it out and snail mail to them. Or if you prefer, send a letter an suggest that Procol Harum shouldn't be missing from their "Hall of Fame" any longer.